As a Muslim I will defend free speech, even if it goes against my traditions and my beliefs, freedom of speech is what defines America, and it is one of the most sacred values of humanity. A few Muslims may not like it, but if they see that Freedom is a God-given, inalienable and inseparable right, they will appreciate it even more. No bull, but very specific items that require calibrated changes are prescribed in this essay. At this time, I am committed to write three articles. The first one deals with clash of values on free speech, one of the most enduring values of humanity and what does it take to catch up with fellow Americans. The second topic will be about Muslim unwillingness to have a conversation with the ones who are opposed, and finally the deficiency of democratic attitudes in American Muslim Institutions that kills many good ideas and what can be done about it. Quran -13:11, “Verily, God does not change men’s condition unless they change their inner selves.” – Muhammad Asad, the Quranic exegist elaborates, “This statement has both a positive and a negative connotation: i.e., God does not withdraw His blessings from men unless their inner selves become depraved (cf. 8:53), just as He does not bestow His blessings upon willful sinner until they change their inner disposition and become worthy of His grace. In its wider sense, this is an illustration of the divine law of cause and effect which dominates the lives of both individuals and communities, and makes the rise and fall of civilizations dependent on people’s moral qualities and the changes in “their inner selves”. Neither Bhagvad Gita nor Quran says the message is for Hindus or Muslims, such is the greatness of holy books, all holy books, the universal books of guidance to build cohesive societies. Indeed there is no compulsion in what one believes (Quran 2:256); even God does not induce one to do things one way or the other, HE has uploaded “Free-will” and “Free-speech” into every human’s DNA. Didn’t he give a choice to Adam as to what would happen if he were to eat the fruit or not? Adam made the choice, God could have stopped him, but he did not, God meant business – he gave Adam a choice and honored his own word. Watch this 3 minutes humorous video about it. Quran 55:5-11 brings clarity to one’s role in life. HE has spread the earth for all living beings. HE has created everything in balance – all things in the universe run per a program – Humans were given a free will to find their own balance and equilibrium. Elsewhere in Quran, he called the human race by the title Ashraful-Mukhlooqat –the honored species. A term to describe the species that did not wash away in floods, blown apart in storms, melted down in heat, crashed under falling meteoroids, died of hunger…. but survived! HE expects this species to preserve and sustain harmony and balance with which he has created the world. That balance is environmental, cultural, religious, physical, social and mental including the human body. There is plenty of wisdom in Quran with which Muslims can fine tune their future. What is good for Muslims has got to be good for all to sustain. No one can live in peace unless people around him are in peace, no one will live securely unless others around him/ her are secure. It behooves everyone to work for common goodness. Security and peace are pluralistic in nature. After leafing through nearly 50 articles in various News outlets, I am disappointed in Muslim organizations in how they reacted towards the nasty “Perfect Man” bill boards that went up in Indiana, Texas and elsewhere in the nation. One of the most cherished values of America is free speech; indeed, it is an Islamic value as well. If Muslims need to build bridges on common grounds, it would be on free speech. All of us need be on the same page. Muslims are far behind on the topic. Muslim responses were that of anger, fear, begging for sympathies and seeking support from others. Can’t Muslims tolerate that nasty Perfect Man bill board? Are Muslims so thin skinned? Is their faith so weak that they think Prophet Muhammad(pbuh) will disappear by such bill boards? Is it easy to provoke them? Isn’t it? As long as you get irritated, they will do more of it. Isn’t it the responsibility of Muslim organizations to understand and communicate the meaning of free speech to Muslims? Every American should fight for his or her right, but without attacking free speech. The intent is to mitigate conflicts and nurture goodwill – a formula of Prophet Muhammad, peace be upon him. 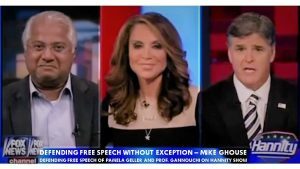 Just take a look some of the titles – a sheer lack of knowledge on first amendment, Google for “Muslims respond to the Perfect Man (Muhammad pbuh) you will find over 50 news items – all negative responses. America solidly stands on free speech, an enduring value we cannot compromise on. Muslims will find comfort with fellow Americans if they fully understand Free Speech. 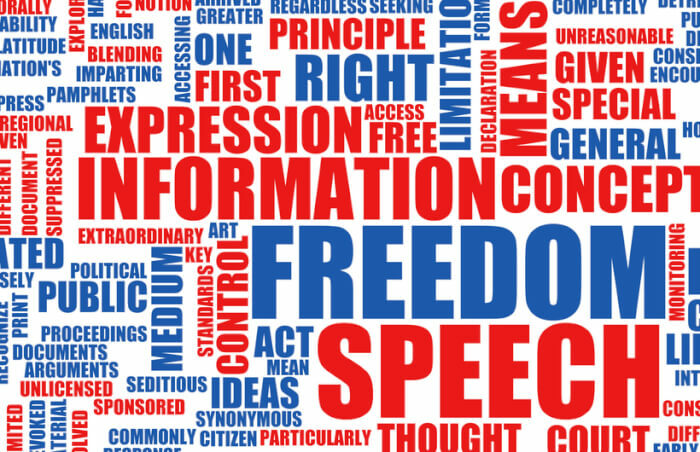 We strongly recommend you to take the online course on Free Speech from the Religious Freedom Center located at Neseum in Washington, D.C. with a weekend attendance at the Center. Please check www.ReligiousFreedomCenter.org This will ease the tension with the stuff like Bill Boards, Muhammad Cartoons, Quran Burning or Quran Bashing. The Center for Pluralism will assist you in every which way, we can and will also arrange for a three hours intensive workshop on First Amendment and Free Speech at your place at your cost. Let’s learn to live gracefully with the free speech no matter how ugly it is. The Center for Pluralism has consistently offered pluralistic solutions on issues of the day, we are in the news every week- if you are in the business of serving public, be there every week and serve the community. Over the last 20 years, we have brought actions and solutions to a variety of issues including: Quran Burning Pastor Terry Jones in Mulberry, Florida and Quran bashing pastor Robert Jeffress in Dallas, Texas. We were involved in Ground Zero Mosque and have responded to Fitna film by Geert Wilders. We have provided standard responses to non-sense spewed by Noni Darwish, Walid Shoebet, Wafa Sultan, Front Page Magazine, and a host of others. This week we will respond to all the items on this nasty bill board. They are not a fact but fiction. We have organized the first Muslim Intra-faith conference with Shia, Sunni and Ahmadiyya Muslims at University of Houston and many conferences and events after that. We have visited every Muslim denomination mosque during Ramadan and chronicled at www.RamadanNews.com .Talking about Muslim unity is fine, but actually doing the work is better. We have chosen to work with all of humanity including those who appear to be Anti-Muslim including – Frank Gaffney, David Horowitz, Robert Spencer, Robert Spencer, Brigitte Gabriel, Pamela Geller, John Bolton, Jamie Frank and several others. At the Center for Pluralism, we produce results and build a cohesive America, where no American has to live in tension, apprehension or fear of the other. THIS POST HAS BEEN READ 43967 TIMES SO FAR. THANK YOU!